Kansas Land Title Association compiles, publishes and sells a comprehensive study guide called Evidencing Kansas Land Titles. This study guide is intended both as a training aid for new employees in the land title business and as a source of information for those who need additional background. 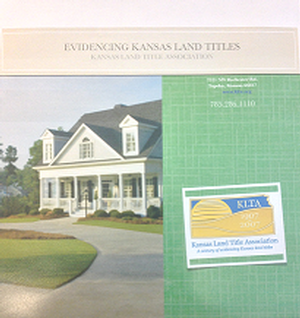 In addition, although it is not an all-inclusive study guide for the exam, Evidencing Kansas Land Titles is an excellent preparation for taking the Kansas abstract licensing exam given by the Kansas Abstracters Board of Examiners. The book is reviewed and updated regularly to accommodate the changing laws and procedures of the business.